AMONG CHARLEMAGNE’S CONQUESTS were the Saxons. This group, who had settled in Europe and on the British Isles, spoke the Teutonic language at the root of modern English. Their Frankish conquerors spoke a tongue derived from late Latin. The Saxons on the European continent were still mostly pagans. Anglo-Saxon settlers in Britain had been converted to Christianity by the mission of Augustine of Canterbury, sent from Rome by Pope Gregory the Great at the end of the sixth century. Some missionary work had also been carried out among them by Boniface (c. 675–754) from Wessex, but though he became the first archbishop of Mainz, the mission had limited long-term success. 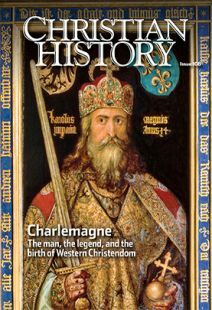 The Frankish annals that told the story of 30 years of Saxon wars stressed Charlemagne’s determination to remove the cultic symbols of Saxon paganism. Boniface himself had famously felled Thor’s Oak in 723. Irminsuls, or standing tree trunks, were important in pagan religion. But it is hard to say whether the Saxon wars were really driven by the desire to convert the Saxon tribes. A famous massacre at Verden in 785, where an angry Charlemagne was described by the royal Frankish annals as seeking revenge for the killing of some of his nobles in a battle, seems to have been motivated most strongly by the lust for conquest. Whether the wars began for that reason or not, Charlemagne (seen in battle with the Saxons above) was later criticized for seeking to convert the Saxons by force. A poet who wrote an epic on the Saxon wars included lines that said that those who would not be persuaded would simply have to be forced by fear. And when it was all over, Charlemagne himself published a document (see p. 14) setting out the terms of the Capitulation of the Saxons. It stated, among other provisions of enforced Christianization, that anyone who refused to be baptized should be put to death. Charlemagne founded it. So what was it? The Middle Ages had many renaissances before "The Renaissance"